To the scions of Shannara have fallen three tasks: Par has recovered the fabled Sword of Shannara, but the Federation's Chief Seeker has planted an awful thought in Par's mind - that he himself is Shadowmen, the very evil he seeks to destroy. Walker Boh has been commanded by the shade of Allanon to recreate the Order of Druids, disbanded for three hundred years. 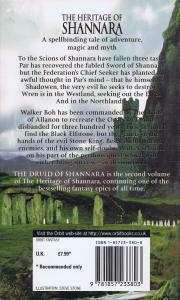 First he must find the Black Elfstone, but the gem is in the hands of the evil Stone King. Beset on all sides by enemies, and his own self-doubt, Walker sets out on his part of the perilous quest which will either bring success - or destruction. 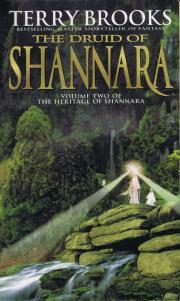 The Druid of Shannara is the second volume of The Heritage of Shannara, continuing one of the bestselling fantasy epics of all time.